One of the hardest decisions young high school students make is deciding what they want to do after they graduate. Even if you have a well-developed plan for what you want to do, things rarely go as they are planned and a lot is left up to circumstances as well as affordability. Many parents want their students to go to a four-year college, but after doing the math, they find out it’s too expensive only for their kid to have a low chance of employment after graduating. Another option they consider is sending their kid directly into the workforce. This is an even less ideal situation because their kid may never be able to develop the skills they need to progress in a career and be paid well. In this blog, we’re going to talk about the top 10 reasons to go with a technical school after graduating high school. According to a study done by Rutgers University, vocational schools have much higher employment rates after graduation as opposed to traditional universities. Many vocational schools see job placement rates close to 100 percent whereas traditional universities are around 50 percent. So what’s the deal? Why are people at vocational schools getting jobs so much easier than those in universities? The main reason is that vocational schools are focused on a specific career whereas universities are focused on an area that could include many different careers. To an employer, a bachelor’s degree is like saying, “I know a bit about everything.” But when it comes to actual specialized knowledge that’s relevant to a career, that can only be attained with a degree from a technical college. There’s no way to understate how important it is to have hands-on training when you’re in school. The unfortunate truth of this is that at a four-year college, you’re not getting this. There are certain majors that will get you some hands-on experience like science degrees. However, just because they’re hands-on doesn’t make them entirely practical for real-world application. The problem with the four-year college approach to learning is that you get a very small amount of experience in a broad range of career paths. Even then, it isn’t really “work” experience. On the other hand, technical colleges are designed to narrow down your approach to career building and have your sights set on one thing. Knowing this will allow educators to provide you with a better education that is actually practical in the real world. However, it should be noted that technical universities aren’t necessarily for everyone. If you’re good at forging your own path and building your own career then a traditional four-year college may be for you, if you and your family can afford the steep costs. Whether you’re just graduating high school or you’re currently working towards a four-year degree, you should always consider the benefits of enrolling in a career college. Our approach is focused on hands-on work for medical office administration, sterile processing technicians, veterinary assisting, administrative assisting, administrative medical clerk, administrative accounting clerk, office clerk, and a wide range of software classes. We offer more career placement assistance to you than a standard university and generally offer more individualized assistance throughout your education. Our educators won’t just teach you a standardized core curriculum, then leave you high and dry to find your way in the challenging job market. They’ll create a specialized plan based on your strengths, weaknesses, and personality to lead you to success in whatever you choose to do. Contact us today to learn more. 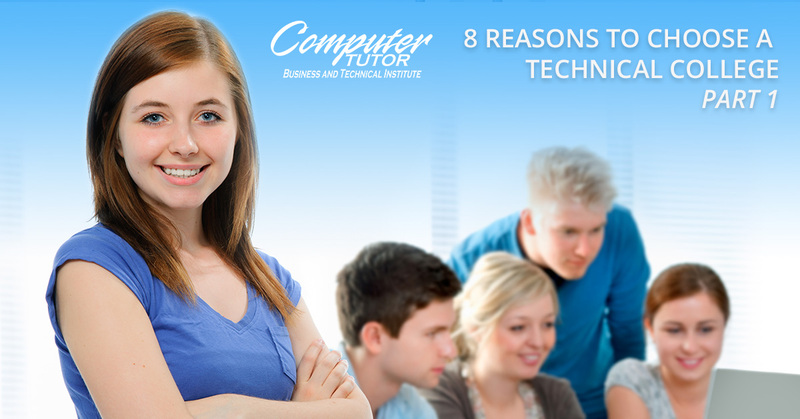 Read part two of this blog series to learn more about the benefits of technical colleges.